HP Umpire Ron Teague ejected RoughRiders Manager Joe Mikulik for arguing an out call in the top of the 5th inning of the RoughRiders-RockHounds game on Tuesday in Double-A baseball's Texas League. B1 hit a ground ball to F3, who threw to F2 as R3 arrived at home plate with PU Teague declaring R3 out on the tag. Replays indicate F2 did not possess the ball when his glove made contact with R3 and that the baseball was on the ground in front of home plate, the call was incorrect. At the time of the ejection, the RoughRiders were leading, 2-1. The Hounds ultimately won the contest, 5-4, in 10 innings. "We are rapidly digressing here from a very valid argument to a third grader who just lost his lunch box." Though Mikulik's argument eventually devolved into what has become known as a typical Mikulik post-ejection tantrum, replays indicate Teague did not see the ball lying on the ground until after he had already signaled the baserunner out at home, a call upheld after consultation and a brief conference with 1B Umpire Clay Park and 3B Umpire Clayton Hamm. 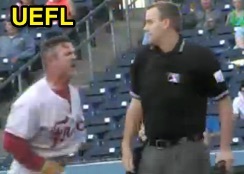 This is Joe Mikulik's first ejection temper tantrum since April 11, 2015 (U1 Bryan Fields; Throwing At), or September 3, 2014 (PU Travis Godec, U3 Rich Grassa; HR/Not HR), or if stealing third base isn't tantrum-worthy, maybe July 28, 2012 (U1 Mike Patterson; Safe/Out) or his 2006 Asheville Tourists performance.